Co-Founder and chief data nerd at Better Dwelling. This week we revealed we’re working with IBM’s Watson artificial intelligence, to build predictive real estate models. We revealed a few tidbits about Toronto, so to be fair we thought we’d give our readers a brief update on what we’ve learned about Vancouver real estate too. Without further ado, here’s a peek at what our robo-intern Watson has learned about the year a home is built, and the property’s value. This isn’t a shocker, but older structures tend to be located on more expensive land. Land with structures from the 1900, 1899, 1887 averaged property values of $21,636,052, $16,574,000, and $7,093,000 respectively. There was one wildcard, structures built in 2015 had the fourth most expensive average land assessment value, with an average of $6,510,555. Older buildings tend to be located on larger, more central plots of land – so it’s somewhat expected they would be worth more. However, 2015 is an interesting break from the pattern. The lowest average property values were a little more random, but there are some correlations with the dates. Buildings from 1800 (which there may not be that many of), have the lowest average land assessment value at $100,800. The next four years were 1998 ($711,605), 1999 ($732,936), 2009 ($839,822), and 1997 ($840,528). What’s interesting about those years are, they were immediately preceded by drops in real estate prices, which may indicate there was a larger number of properties built to maximize profits over land value. The artificial intelligence engine also produced some interesting insights when looked at by median property value by decade built on. The 1930’s produced properties with a median average value of $3,383,473. On the flip side, homes built from 2000 – 2010 were the decade with the lowest average land value, with a media of $1,100,257. So if you’re looking to maximize land value, you might want to start finding homes made in the 1930s. While that’s just a few of the insights Watson provided, it does highlight an interesting pattern of land development in Vancouver. The development cycles of property, and the value assigned by certain neighbourhoods by decade, gives us a better understanding of where Vancouverites want to live. If pricing is higher in neighbourhoods developed in the 1930s, how will tearing down these homes impact future land value? I guess that’s another question we’ll take a look at on another day. This article was published Dec 6, 2016 on the Globe & Mail and was written by Brent Jang. Real estate assessments for single-family detached houses in the Vancouver region soared 30 to 50 per cent in value over only a one-year period, underscoring the frenzied state of the market in mid-2016. While property values have risen steadily over the past 16 years, the latest increase from July 1, 2015, to July 1, 2016, is the sharpest for any one-year valuation period in the Vancouver area in recent memory, said Jason Grant, an assessor with BC Assessment. “For detached homes in close proximity to Vancouver, you’re looking at increases of 30 to 50 per cent being quite typical, and that’s all the way from Coquitlam to Squamish,” he said in an interview on Tuesday. Other communities affected include West Vancouver, North Vancouver, Burnaby, Port Coquitlam, Port Moody, Richmond and Surrey. The provincial Crown corporation estimates values on behalf of B.C. municipalities, which use the data to determine how much homeowners will pay in property taxes. Mr. Grant emphasized that the July 1, 2016, valuation date for properties is especially important because the housing market in and around Vancouver has cooled off since then. Assessed values differ from market prices, Mr. Grant pointed out. The average price for detached properties sold in Greater Vancouver hit a peak of $1.83-million in January, 2016, and remained high in July at $1.76-million. In November, the average price for detached houses sold in Greater Vancouver decreased to $1.61-million. Vancouver-area homeowners have grown accustomed to watching their real estate values climb, especially since mid-2013, though housing sales volume has tumbled since setting a record high in March, 2016. The B.C. government implemented a 15-per-cent tax on foreign home buyers in the broader area known as Metro Vancouver effective on Aug. 2. New assessment notices will be mailed on Jan. 3, 2017, and will also be available online. 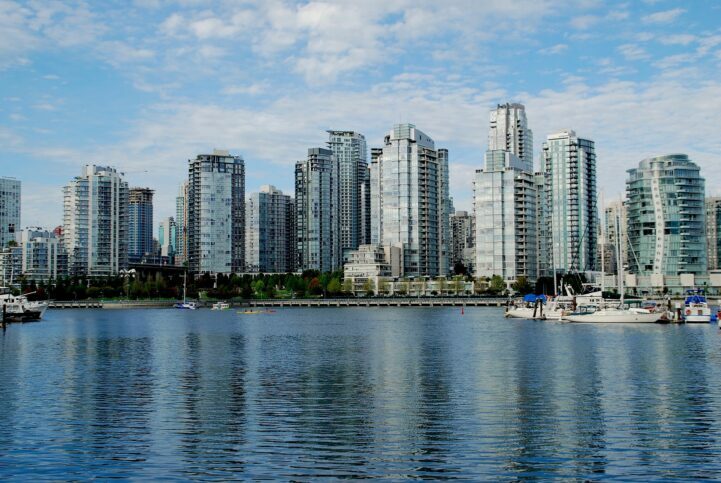 For condominiums and townhouses with “strata title” ownership in the Vancouver region, typical valuation increases from July 1, 2015, to July 1, 2016, were from 15 per cent to 30 per cent. “We’re seeing commercial and industrial properties moving 10 to 30 per cent higher, so there is strong movement, particularly anything purchased for eventual residential or mixed-use redevelopment. Some sites lend themselves to rezoning applications, and those sites would typically exceed the range for assessment increases,” Mr. Grant said. Christopher Whyte of BC Assessment said the typical range for annual increases in assessed values in Greater Victoria ran from 10 to 40 per cent for detached houses in places such as Victoria, Oak Bay, Saanich and Sidney, compared with hikes of 5 to 20 per cent in the Central Okanagon. “During December, BC Assessment is providing courtesy notification letters to property owners whose assessments are increasing significantly more than the typical range of change,” the B.C. Crown corporation said in a statement, adding that it expects to send roughly 90,000 letters, accounting for 4.5 per cent of the province’s two million properties of various types. It has been three years since the City of Vancouver decided to step in and protect its remaining character housing, and finally, consultations with the public have begun. House demolitions in the city have been on the rise – an average increase of 80 per cent, between 2009 and 2015 alone – according to city data. Of those homes, 73 per cent were built before 1940. But the real incentive for finally addressing the problem are survey results last year that showed 90 per cent of respondents are for the retention for character buildings. The city pretty much has no choice but to stop the bulldozers from destroying everything in their path. “The goal is to retain and reuse the buildings and add to the lots, rather than clear-cutting the houses with their landscapes, and starting over,” says author Michael Kluckner, who advised on the review, as member of the Vancouver Heritage Commission. Houses built in the early turn of the 20th century and before the Second World War years, were often of exceptionally high quality. They were built out of old-growth timber not available today, with an attention to detail that was surprising, considering they wouldn’t have had electric tools in the early days. But tastes have changed, and many people opt for new over old, no matter what the quality or durability. The houses come down and the remains of them either go to the landfill or get ground up into hog fuel. The new houses are big and bland. It’s doubtful anybody will go to the bother of trying to preserve them 100 years from now. And because so many of them are made out of inferior materials, it’s unlikely they’ll even be standing in three decades. Since it started, the big-house craze hasn’t served the city very well. The pink and beige monster homes built in the 1980s and 1990s haven’t held up, either in aesthetic appeal or durability. Stucco has a way of growing mould and mildew that makes it unsightly after a few years. This is the look throughout much of Vancouver. More recently, the old houses are coming down to make way for boxy houses clad in Styrofoam, to resemble European estates. We can only imagine how a material such as Styrofoam will hold up a decade from now. We have traded quality and craftsmanship for big and ugly. And although they put it in far more delicate terms, the city has finally agreed that this is a problem. That’s why design guidelines are being looked at for new builds, as well as the most obvious idea of all – to prohibit a bigger house than the one that already stands. Instead, the new house would be much smaller than currently allowed. But they could allow two secondary suites, possibly strata, which would have great economic benefits. They could even carve a big house into multifamily units. More density is definitely a key part of the plan, which makes sense, because there is no saving the old houses without making them economically viable. I’ve yet to meet a heritage or character house activist who doesn’t believe in density as part of the solution. At the first open house Monday, on the west side, where the demolitions are most prominent, the room was fairly bustling, with a turnout of more than 400 people. Others were skeptical about the process. Long-time Dunbar resident Lissa Forshaw watched as her family home was torn down and tossed into the garbage. This was before the city introduced a recycling program. She wonders if the review is less about preservation of character and more about a push for density. Like some others in the room, she had her reservations. She says the city made a tactical error in 2009, when it changed zoning to allow for houses to be built 17 per cent bigger to allow for secondary suites. This was very much a lost opportunity for the city, which should have used the allowance as leverage to protect houses. It’s easy to understand the skepticism. At 4255 W. 12th Ave., a big 1914 Point Grey arts and crafts house that is part of a matching set of three houses is destined for demolition. Inside, it still has the original coffered ceiling and wainscoting, and other wood details. The house is on the heritage register, but that won’t save it. The owner, who does not live in the house, wants it torn down and has applied for a demolition permit. She’s right. Beautiful old houses come down every day, and there’s nothing to stop it. The focus of the review is houses that fall within RS-1 zoning, which is where most pre-1940 single-family house stock is concentrated. The study groups include west and east areas of the city. In RS-1, there are few constraints on what an owner can do, which is another reason it’s the focus of the study. Kitsilano zoning, for example, which allows multifamily conversions, is working pretty well to protect old character houses. In other words, they are creating a ton of options. And that’s a good thing, because as it is right now, it’s too often easier to tear an old house down rather than fix it up. The building codes that get in the way of fixing up an old fixer-upper are also being addressed as part of the study, Mr. Kluckner says. He says we should be moving toward a renovation culture again –and away from this wasteful demolition culture. “That’s where [the changes] will live or die–whether it’s possible for people to renovate these houses without being raked over the coals by the ‘greenest city’ and building bylaw stuff, the way people are now,” says Mr. Kluckner. “ I think the building code really is just the epitome of a nanny state. It’s so prescriptive, and the hoops people have to jump through even to just renovate a house. They are flying in the face of the city’s stated intention that they want to retain these areas, that they want to do a character retention – and also flying in the face of the idea that they want to reduce and reuse, as opposed to demolish and rebuild. “ Also, Mr. Kluckner would like the option to subdivide properties. The proposal does include strata units, which offer a big economic lift, but a fee simple subdivision is not in the offing. Caroline Adderson, who is an activist for the old houses, says she’s pleased with the review, but she’s worried about the houses that come down in the interim. She fears the lead-up to the new zoning could put the remaining houses in jeopardy. The results of the public surveys will go to council in 2017, and then council will decide if it wants staff to proceed. It could easily take another year of planning. There is hope that not only will the houses be saved, but that as a result of the zoning, prices might become more aligned with local incomes. There would certainly be more rental stock. Ms. Adderson says the houses are currently unaffordable because there are no restrictions on demolitions. As proof, she says she has catalogued about 450 demolished houses on her Facebook page, and almost all of them were demolished to make way for luxury development. “Nobody local is buying a house for $$2-million and destroying it,” she says. “It’s all developers catering to the luxury market. It beats the alternative, which is a clear-cut city. 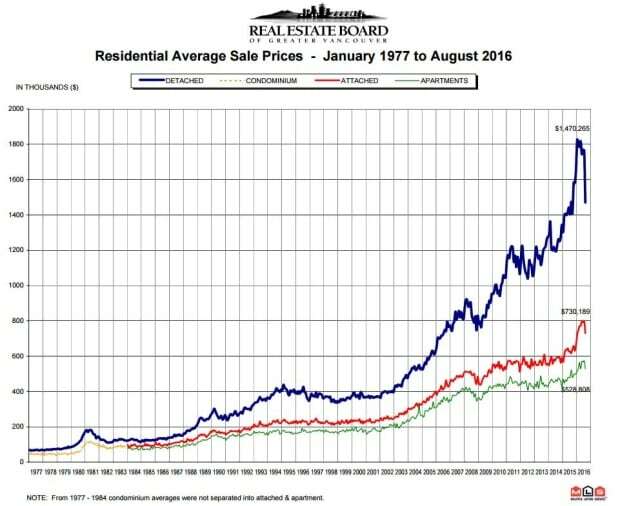 This article appeared in the CBC News on Sept 03, 2016 and was written by Jill Slattery.”Is the Metro Vancouver real estate market in free fall?” shouts the headline. “Canada’s housing market nears ‘extreme bubble,’ warns ex-Lehman Brothers trader,” screams another. “Fear and loathing in the Vancouver property market,” warns the CBC. It’s enough to leave the impression that property values in Vancouver’s sky-high real estate market could be collapsing. Indeed, if you dig into the latest statistics released on Friday by the Real Estate Board of Vancouver, you’ll find that the average price of a home in the region has actually fallen — drastically. A graph of the market published by the Real Estate Board of Greater Vancouver shows the average price of a single-family detached home topping out at $1.8 million at the start of the new year, and then dropping sharply to $1.47 million last month. That’s a loss of about $350,000 on the average home — one could conclude. And depending on whether you are a buyer, seller or renter, that could look like great news, terrible, or really just annoying. The truth is — unless you’re one of those fortunate folks operating in the upper end of Vancouver’s luxury market — the average price shouldn’t mean squat to you. Average prices are just that. They take all the homes being sold, including those worth $5 million, $10 million or $15 million, and put them in the same box as the much more typical single-family residence. And it just takes a few of those stratospheric deals to skew the average value for the whole market pretty significantly. 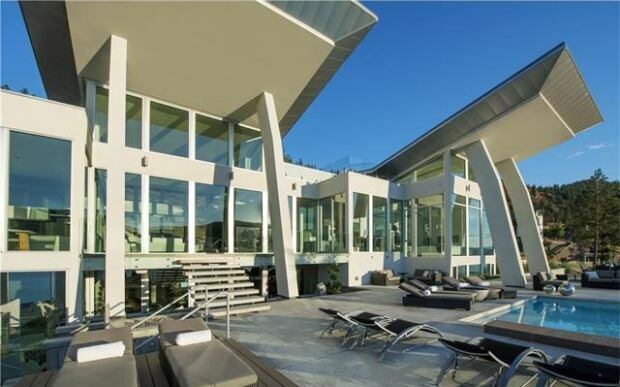 The sale of just a few luxury homes can skew the average price across the entire market, industry experts warn. So when the flurry of activity at the luxury end of the market dropped off this summer, with the reported prices of some homes dropping by millions, it should come as no surprise to see average prices dropping dramatically too. But that’s not what the numbers say is happening across the rest of the market — and why typical homeowners should not be looking at the average price and concluding that the value of their family home is suddenly in free fall. A more accurate gauge of the value of a typical house is calculated by the industry based on what they call the benchmark. A benchmark home is much more like the one most of us live in. In the benchmark home, the number of bedrooms and bathrooms are measured in single digits. The square footage only has one or two zeros at the end — not four or five. Parking garages lack vehicle elevators and the views include neighbours’ backyards, not panoramic vistas. And when you look at the benchmark prices for Metro Vancouver homes, they have not walked off a cliff, plunging into free fall. In fact, they are still climbing, albeit just barely. Words like peaked, flattened, stalled apply. Those are the ones that best describe what’s happening now to the value of the typical Metro Vancouver home. 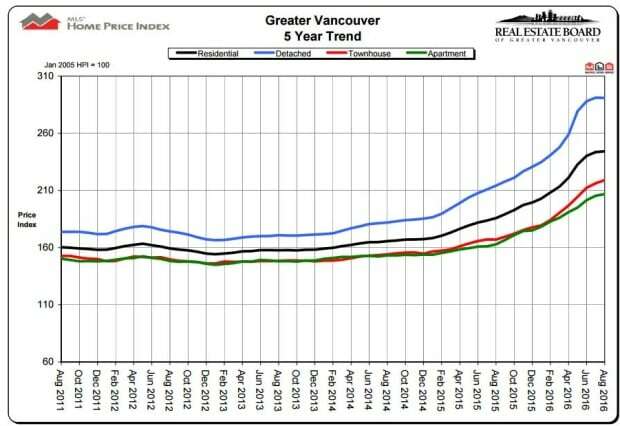 This is not to say that it is perfectly clear what is going on with Vancouver’s real estate market. Everyone in the business admits that the province’s 15-per-cent tax on foreign buyers has dramatically curbed activity and the number of homes sold has dropped off dramatically. But the figures also show the number of buyers in the market is still out pacing sellers, and so far there are no signs of panic selling, boarded up homes, and speculators defaulting on multiple underwater mortgages. Maybe that’s all coming down the road — maybe — but for now most people are still complaining they can’t find anywhere affordable to live in this city. And there is ample evidence that those wealthy foreigner buyers never left B.C. Many just have flocked to Victoria, where the tax does not apply, luxury homes are a relative bargain and sales climbed 19 per cent in August. There is no doubt Vancouver has supercharged real estate values, as prices have outstripped wages for years, and griping about real estate is more popular than the weather. But, unless there is a mass exodus from this city, that’s all unlikely to change. So when the next headline makes you wonder if the bottom’s fallen out of the market, and your home’s value is in free fall, take a deep breath and remember: the typical homeowner has a lot less to fear than the average.